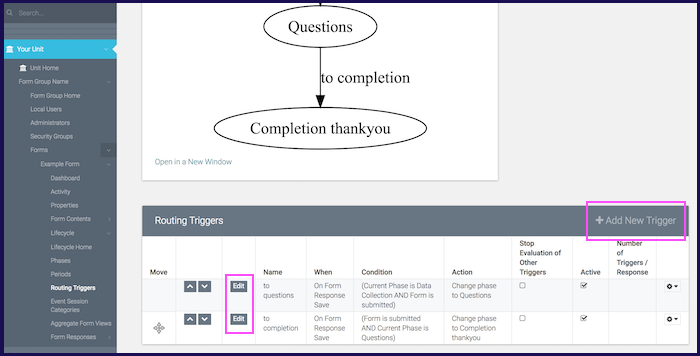 This tutorial explains how a formbuilder can design a form to change phases and/or trigger routing actions automatically after a period of time has passed or when a form has been matched specific criteria for a given period of time. 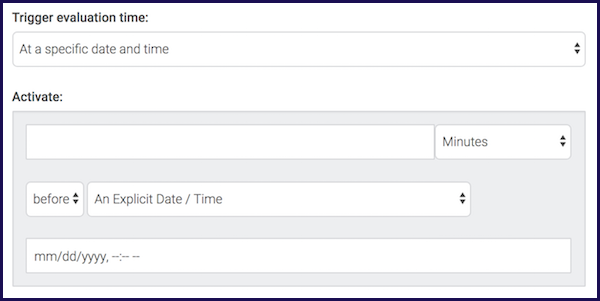 A form sitting in Data Collection or Review Approval will automatically be moved to completion after a certain period of time or at a specific date and time. A form submission will move to the next phase once the time defined is matched. A form responder begins to fill out a form but does not submit it to review, and the form administrator wants to set up an automated email to a form responder to remind them to finish filling out the form after a certain period of time has passed. In order to set up a "time bomb," shown in the steps below, you will build a new routing trigger. 1.) 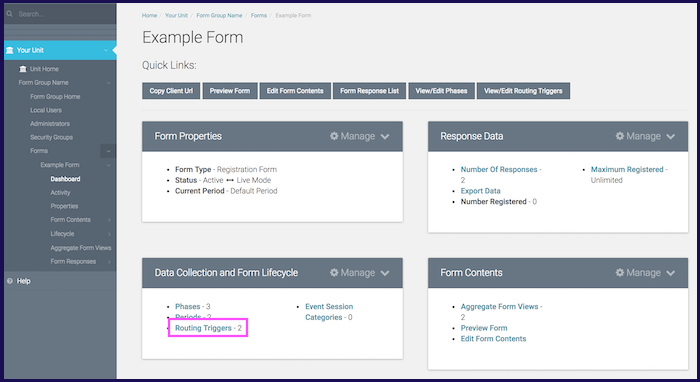 Navigate to the Data Collection and Form Lifecycle tab on your form's dashboard. Select 'Routing Triggers'. 2.) To edit an existing routing trigger, select 'Edit'. To create a new routing trigger, select 'Add New Trigger'. 3.) Fill in the fields in the Trigger Properties tab. In the 'Trigger evaluation time' drop-down menu, there are three options, two of which are useful for the "time bomb" feature. After the form response has matched the Trigger Condition for a given length of time: With this, you can designate a length of time after which the Trigger Condition is matched to set the Routing Action into action. For example, an email will be sent from the form administrator to the form responder once the form has sat in Data Collection for a week. At a specific time and date: Sets off the trigger at a specific date and time. For example, no matter what condition the form is in, once the designated date and time has passed, the form will be moved on to the next stage. 4.) Create the rest of your routing trigger, using the tools provided to accomplish what purpose it will serve. If you need more guidance on this topic, check out ATLAS FormBuilder - Lifecycle - How to Build a Routing Trigger and ATLAS FormBuilder - Lifecycle - Trigger Conditions Explained. 5.) Remember to save your changes!